The Department of Art offers the following undergraduate degree programs: Bachelor of Arts (BA) in Studio Art and Bachelor of Fine Arts (BFA) in Studio Art. The limited access BFA Program is available to those students already pursuing a BA in Studio Art at Florida State University. Incoming freshmen and transfer students must meet the requirements for admission to the university. View the minimum University admission requirements. Applicants transferring directly after earning the AA degree from a Florida public institution will receive priority consideration for admission. There are no pre-requisites for declaring a BA in Studio Art and there is no portfolio review process. Students can enter the Studio Art Program in Fall, Spring, and Summer terms. The minimum GPA is the university-required 2.0. 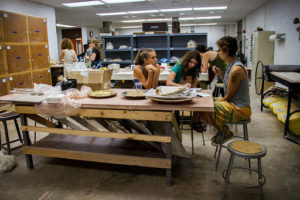 If students are wishing to transfer from other Florida based colleges, the following courses from these institutions can prepare students for the BA and BFA Studio Art programs: Tallahassee Community College, Valencia College, College of Central Florida, Northwest Florida College, or Florida State College at Jacksonville. Good preparation for your intended major is the best preparation for admission. Our Academic Advisors are here to help make your transition to FSU a smooth process.